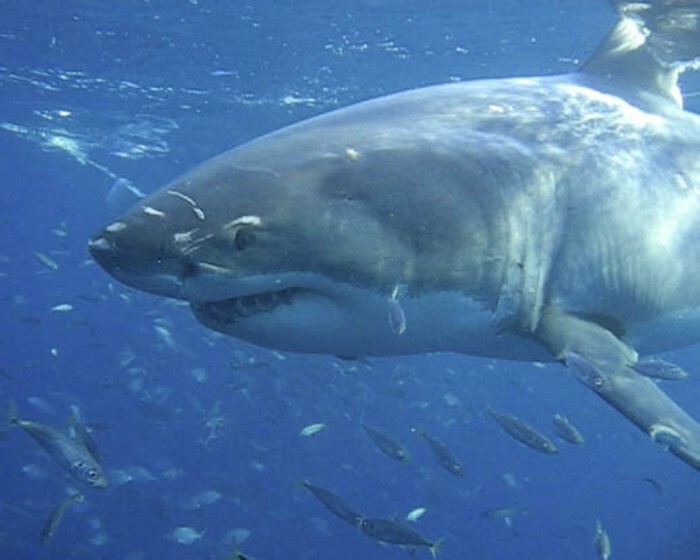 South Australia’s Rodney Fox Expeditions is the only operator in the world where you can scuba dive with great white sharks. Chris Mitchell comes face to face with the ocean’s most fearsome predator. It comes out of nowhere. One moment I’m intently scanning the blue that’s empty all around, the next moment there is the massive, deadly bulk of a great white shark silently gliding only inches from me. It’s at least four metres long, nearly a ton in weight and fully capable of biting me clean in half. I can see the ghastly smile of its razor sharp teeth, the roughness of its grey and white skin and the big, black, blank eye that’s staring right at me, and the only thing between me and the great white are the bars of the aluminium cage I’m in, 10 metres down on the ocean floor. If I was feeling particularly stupid, I could reach out and touch it. My throat suddenly feels dry and I realise I’m taking several shallow, rapid breaths through my regulator as the adrenalin surges through my system. The coldness of the South Australian water is suddenly forgotten. I’m face to face with the stuff of most people’s nightmares. This article was first published in Asian Diver magazine, Issue 98, 2008. It appears here in its unabridged form. But besides the reflex sensation of fear, I’m also feeling an unmistakable euphoria at being so close to this savage yet undeniably beautiful creature. I follow the great white as it slowly circles around us, curious about these new arrivals to its reef. It casually inspects the cage and its occupants for another couple of seconds, its eye implacable and unblinking, and then imperiously arcs away back out into the blue with a single flick of its massive tail, its shadow fading away across the sand. Each of us look at each other and cracks a huge grin. Welcome to cage diving with great white sharks, Rodney Fox style. Rodney Fox Expeditions is the only operator in the world that lets scuba divers descend to see great whites on the reef itself, as well as providing the more traditional shark cage tethered to the boat just under the ocean’s surface. Winched down by a hydraulic crane onto the sand of the reef below, the scuba cage provides a unique perspective on these fearsome predators in South Australia’s winter waters and lets divers get right in amongst the sharks’ own reef environment as well as being able to see them at the surface. The 10 – 15 metre visibility at the Neptune Islands means that it’s easy to become preoccupied with the big rays and napoleon wrasse that inhabit the reef, and to forget you’re doing the dive to see great whites – until one of them makes an appearance. It’s no surprise that Fox Expeditions pioneered the scuba cage dive – Rodney Fox is a living legend in shark circles, having miraculously survived a Great White attack in 1963 despite requiring 412 stitches. After making a full recovery, Fox faced his fears and became a recognized world authority on the great white shark. 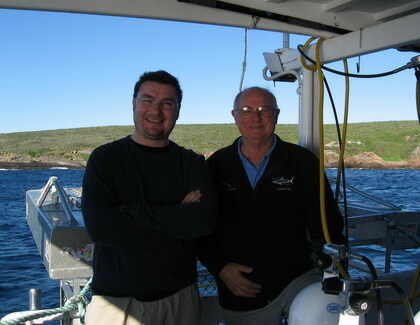 Fox has been running great white expeditions off the coast of Southern Australia from Port Lincoln for over 40 years. He has been involved in virtually every film ever made about great whites, including Jaws. He also set up Adelaide’s Rodney Fox Shark Museum and The Fox Shark Foundation to tag, name and monitor the great whites that are seen on expeditions. It’s a remarkable series of achievements for a man who nearly died after being attacked by the very creature that he’s worked so hard ever since to protect. (You can read my interview with Rodney Fox by following the link). Today Rodney’s son Andrew runs the expedition trips and Rodney, now 66 years old, attends as a guest of honour on several trips a year. The wealth of knowledge and fascination that the Foxes have about great white sharks makes a big difference to the enjoyment of the trip. But Rodney is remarkably modest and without a hint of machismo. As a shore party left to go and see the seal colonies on the northern Neptune Island, Rodney could be heard on the radio telling the tour leader to “make sure you pick some of those pretty flowers” to the great amusement of everyone else. The shark trips run from three to five days to ensure the best chances of shark sightings. Of the 12 guests on our trip, 4 had come back to do it again, so amazed were they by their first encounter with the whites. Why do great whites exert such a fascination on the human imagination? Perhaps it’s because we have a primal fear of being eaten alive. When a diver comes face to face with a great white, they’re not just seeing the looming, sinister presence of the real shark itself – they’re seeing a living, breathing symbol of death with the Jaws theme tune playing in the background for good measure. But seeing the whites also makes you realize they are not the crazed killing machines of popular myth – they move with a fearless mix of grace and guile, perpetually unpredictable and so continually fascinating. The jangle of adrenalin caused by fear never goes away even over four days of great white watching, but it’s certainly becomes easier to control once you realize that the great whites won’t be malevolently battering the cage in order to gain access to its fleshy occupants. That said, my very first entry into the surface cage couldn’t have been more dramatic. After sliding into the icy 14 degrees C water encased in a 7 mil wetsuit, hood, gloves and a bulky weightbelt, I clutched onto the cage’s handrail to steady myself. My dive hood and the viewing slot of the cage narrowed my vision to looking out into the blue straight ahead. There was no sound but my own breathing through the surface pumped hookah and the muffled rumble of steel on steel as the cage gently moved in the surface swell. The tuna bait attached to a rope floated on the surface just above us, the sun streaming through the water, but not making the ocean feel any warmer. Without warning, the great white appeared right beside me, its size dwarfing the width of the cage. The atmosphere in the cage was electric as the four of us craned to see where it would go as it looped around and behind us. Then, just as it seemed the white had disappeared, the whole cage suddenly shook violently as the great white slammed into it with the full one ton sideways force of its body. My two dive buddies nearest to the white were nearly knocked over by the force of the impact, and the four of us in the cage could only watch in amazement as the white twisted and rolled in a frenzy to rip the tuna bait from its rope, having lunged at it from below with fantastic speed that was wholly at odds with its seemingly indifferent inspection of the bait only moments before. The great white’s jaws fully opened so that for a split second I was staring into a razor-edged abyss into which my whole body could fit, before it engulfed the bait and hurtled away from the surface, leaving a nothing but a swirl of bubbles, a frayed rope and 4 slightly shaken but totally exhilarated cage divers. To be separated from a great white shark ripping its prey to pieces by only the thin bars of an aluminium cage is something I will not forget easily. Witnessing this same mode of attack from the dry comfort of the boat deck is equally impressive. The sharks that come in to take the bait often breach the water in spectacular fashion as they attack their prey. The great white will launch itself nearly half way out of the water as they seize the bait, having come in for the attack directly below and accelerating to 30 miles an hour in an unstoppable onslaught that has so much power they explode out of the water. The shark breaches for a couple of seconds at most, and it has the same wholly unpredictable ferocity and speed as underwater. It was here that Rodney Fox lived up to his reputation. On our final afternoon, a couple of hours from departure, everything had gone quiet. Rodney took over holding the bait rope. There were a few of us standing behind him, getting a bit bored scanning the empty water, so we started teasing Rodney. “Go on Rodney!” we said. “Show us your magic!” He gave a flick of the bait rope, saying “It’s all in the wrist”. Within 5 seconds of Rodney picking up the rope, a great white breached almost wholly out of the water only 10 feet away from the boat and took the entire bait in one huge thunder of water and shrieks of disbelief and amazement from the rest of us. It’s hyperbole to say that cage diving with great white sharks is life changing, but it’s not far from it when you’re blessed with conditions and shark activity like those of the Neptune Islands. A great white up close is truly fearsome, but it’s also truly beautiful, and it’s that combination of power, danger and grace that makes seeing them not only unique but genuinely moving. It’s easy to see why Rodney Fox dedicated his life to discovering more about great whites and protecting them, and why his son Andrew has become equally fascinated too. I hope they both long continue to introduce the rest of us to the realm of Australia’s great white sharks. Rodney Fox Shark Expeditions depart from Port Lincoln in South Australia. The nearest international airport is Adelaide. Connecting flights from Adelaide to Port Lincoln can be booked with RegionalExpress.com.au, usually called Rex. You can compare flight prices on , and .